When aesthetics are a primary concern in your restorative treatment plan, metal-free dental crowns in Medford are a wonderful treatment option. These restorations repair damaged or missing teeth in the front of the smile. Made out of life-like dental ceramic or porcelain, metal-free crowns improve the form and function of the teeth you can see. Inlays and onlays are another natural-looking option for damaged teeth. Continue reading to learn more about metal-free dentistry from Dr. Gary Rosenfeld at Island Daily Dental Care! You may need a dental crown to repair a broken, weak, or worn tooth. Dental crowns can also be used in single tooth replacement when supported by a dental implant. A crown often completes a root canal procedure. Metal-free dental crowns are made out of porcelain or dental ceramic, a material that looks and acts just like your natural tooth enamel. Porcelain crowns are sturdy enough to withstand the normal force of chewing and can last for many years with proper care. Inlays and onlays are the appropriate solution for teeth that are moderately decayed or damaged, used when a filling would not provide enough of a solution but a crown would be too invasive. Also known as an indirect filling, an inlay or onlay is created separately from the tooth and then bonded securely onto the damaged area. An inlay fits into the cusps of the chewing surface of the tooth. An onlay reaches over the sides and can be used to repair decay between the teeth. 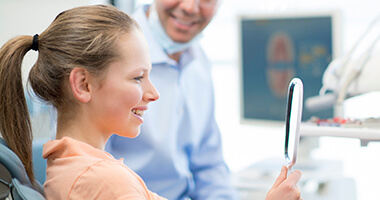 To place your metal-free crown, inlay, or onlay, Dr. Rosenfeld will begin by putting together a treatment plan to restore your smile to its full health. If you need a crown, we will first reshape the tooth to make room for the new restoration. Impressions are then made of the tooth and surrounding structures, and the final restoration is created in a separate lab. Inlays and onlays do not require significant reshaping of the tooth. You will wear a temporary restoration in the time between appointments, and then return to our office for the final placement of your crown, inlay, or onlay about two weeks later. We will check to ensure the restoration looks and fits like it should before securely affixing it to the affected tooth. It is important that you maintain excellent dental hygiene following the placement of your metal-free restoration. Continue to brush and floss regularly, and visit your Medford dentist every six months for a cleaning and examination. We will continue to check in on your restoration and provide repairs if necessary. Is tooth decay or damage getting in the way of your most beautiful, confident smile? If so, please do not hesitate to get in touch with Island Daily Dental Care. We can help you enjoy a natural-looking smile solution with metal-free restorations. We invite you to request an appointment today!